The Military Heritage of Ireland Trust CLG is very happy to announce that the National Museum of Ireland exhibition Soldiers & Chiefs – The Irish at War at Home and Abroad since 1550 has won the award for the best exhibition in Ireland 2009 /2010. The museum awards were jointly hosted by the Heritage Council in partnership with the Northern Ireland Museums Council. Congratulations to all concerned. The National Museum of Ireland opened this major exhibition at Collins Barracks in October 2006. Using original artefacts, letters, replicas and audio accounts it shows how soldiering and war have affected the lives of Irish people. There are three main themes; Irish soldiers at home, Irish soldiers abroad and Irish soldiers in the 20th century. These are explored through the eyes of the soldier and through those of civilians caught up in war and conflict both here in Ireland and overseas. Military artefacts on display include unusual items such as the sword of one of Napoleon’s soldiers, playing cards taken from a pirate ship, Christmas cards and chocolate boxes from the trenches, a child’s gas mask, uniforms, rifles and the flag of the Irish Republic. It is hoped these will bring alive the military and social history of the Soldiers and Chiefs. The new 3 storey purpose-build exhibition space houses planes and armoured vehicles on loan from the Defence Forces and the Air Corps. These are displayed to tell the tales of men, who flew, drove and serviced the vehicles in Ireland and on UN Peacekeeping duty. The Friends of St Patrick are to be commended for this most generous offer, which, we are informed, is much appreciated by the children, families and teachers in Chad. 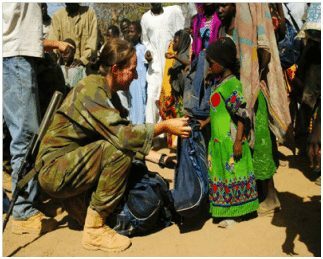 The Trust was pleased to be of assistance in this matter and also wishes to note their appreciation of the quick response by Maj. Gen. Dave Ashe and the members of the Defence Forces in transporting the items to Chad. Col Ned Falloon (British Army Retired) presented a photograph to the National Museum of Ireland at Collins Barracks, Dublin for possible display in the Soldiers and Chiefs Exhibition there. The photograph depicts a Royal Review held in the Phoenix Park, Dublin by King George V on the 11th July 1911. The March Past of the then Officer Training Corps in Ireland included personnel from Queens University Belfast, Trinity College Dublin, College of Surgeons Dublin, Campbell College Belfast and Cork Grammar School. 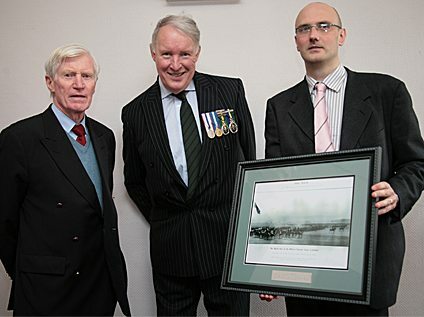 Our picture here shows Col Falloon with Gen Paddy Nowlan, Chairman of the Military Heritage of Ireland Trust, and Mr Lar Joye who accepted the presentation on behalf of the National Museum.